Regarding the set of all feature attributes in a given database as the universal set, this monograph discusses various nonadditive set functions that describe the interaction among the contributions from feature attributes towards a considered target attribute. Then, the relevant nonlinear integrals are investigated. These integrals can be applied as aggregation tools in information fusion and data mining, such as synthetic evaluation, nonlinear multiregressions, and nonlinear classifications. Some methods of fuzzification are also introduced for nonlinear integrals such that fuzzy data can be treated and fuzzy information is retrievable. 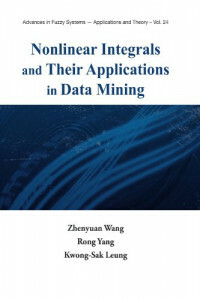 The book is suitable as a text for graduate courses in mathematics, computer science, and information science. It is also useful to researchers in the relevant area.